It’s been over three years since Khalsa and Dunkirk locked horns, the Nottinghamshire side’s exile in the East Midlands Counties league ending with them winning the title last season. Back in September 2015, Khalsa romped to a 4-0 victory over Dunkirk thanks to a double for Tes Robinson and goals for Craig Bannister and Marvin Nisbett. This came just weeks after a jolting defeat for Khalsa at Dunkirk which had seen them beaten 3-1 in just their second game in the Midland Football League after winning the West Midlands League. A lot of water has passed under the bridge since then, of course. Going into this fixture, Khalsa will be fourth and Dunkirk 18th, seven points above basement side South Normanton Athletic. Dunkirk’s -18 goal difference is the second worst in the division, only Wolverhampton Sporting Community having a worse deficit. 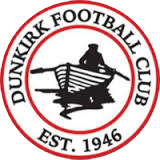 However, Dunkirk come on the back of an impressive victory over big spending AFC Quorn thanks to second half goals by George Bosworth and McKenna Parton. Although they haven’t exactly been awash with goals this season, Romello Nangle stands out having grabbed seven this season.